“Power projection is the capacity of a State to apply all or some of its National Power to effectively deploy his Forces from outside multiple locations; to respond to crisis, contribute to a deterrent and enhance Regional Stability. And Military Bases outside the geographical boundaries of a Nation, which according to its size, are utilized to project Strategic Actions, Logistic Support, Communications and/or Intelligence Gathering, are indicative of National Power of the State. “A Nation that displays its National Power beyond its sovereign limits is considered more powerful than a nation having Large Army but is only active in the region.” These are golden words of General Dwite Eisenhover at the start of Cold War in 60s.The step taken by Indian Prime Minister Narendra Modi in taking initiative to establish “First ever Military Base of India” on Foreign Soil must be viewed in this context. The move which he initiated in 2015 has borne fruits in 2018. The move enables India to establish its first overseas military base on Assumption Island in Seychelles Archipelago, strengthening its naval presence in the Indian Ocean to counter growing Chinese influence in that strategically critical region. 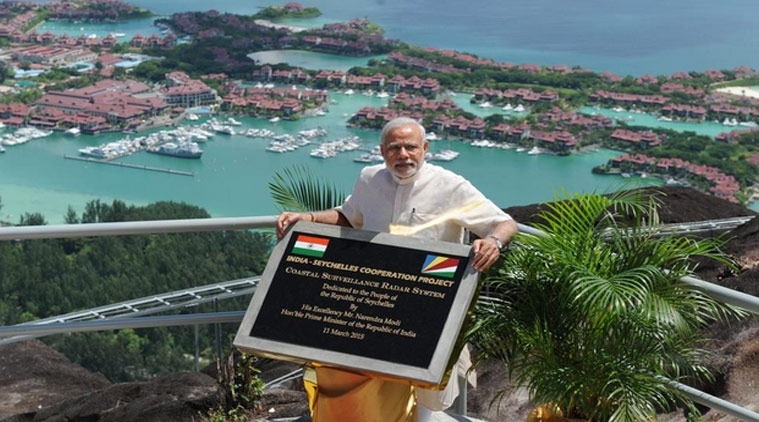 Prime Minister Narendra Modi had gifted a P 81 Maritime Reconnaissance Aircraft, Two Helicopters, Two Coast Guard Intercept Boats and a complete Coastal Surveillance Radar System to Seychelles during his first visit in 2015. Periodically, Indian Warships also used to visit Seychelles while on Anti-Piracy Patrols around Africa. India who fears encirclement by an increasingly militarist China under “String of Pearls Strategy”, is going to invest 550 million Dollars in building this base to help it ensure the safety of its strategic and merchant ships/vessels in the Indian Ocean. Assumption Island is very close to the Mozambique Channel from where in, much of the international trade transits. India has Military Cooperation Agreement with the Seychelles since 2003 but amended Defence Cooperation Pact between two countries was signed only on 27 January, 2018. The deal, which follows intense diplomatic negotiations, will provide India with a crucial Military Staging Point in this critically strategic region. In 2016, approximately 40 million barrels of oil per day travelled through Indian Ocean Entry and Exit Points through Straits of Hormuz and Bab el-Mandeb in the West and Malacca in the East. India, which has more than 7,500 kilometers of coastline and sits at the very center of the Indian Ocean, is dependent on free and open access to these same shipping lanes for trade and supply of crude oil. In the early 2017, China established its first Overseas Military Base in Djibouti, near the Bab el-Mandeb Strait which connects the Mediterranean Sea via the Suez Canal, and the Red Sea to the Gulf of Aden and the Indian Ocean. The opening of the Djibouti base was followed months later by the country's controversial acquisition of the Hambantota Port in Sri Lanka, just 22 kilometers from the Primary Indian Ocean Sea Lane that links the Malacca Straits to the Suez Canal. Hambantota gives China an advantageous position by providing Strategic Access Point into Indian Sphere of Influence, to export its goods into India's economic sphere, under Beijing's "One Belt, One Road" economic initiative. Assumption Island was discovered by Captain Nicolas Morphey in 1756. It is a single coral island which measures 11.6 km2 in area. The western shore features an almost uninterrupted sandy beach of 5.5 km. Two large sand dunes are prominent on the southeastern coast of the island. The island is dominated by expanses of bare rock and caves, and is covered with Casuarina Trees and Coconut Palm Plantation. The island is bisected by a 1,210 meters long Concrete Airfield. The island also has a small port called St. Thomas Anchorage. India will build/develop a Military Base on this island which is 3,915 km from Kanyakumari to include both an Air and Naval Base. For the India, Assumption Island is a Prime Territory for setting up its First Foreign Military Base, located away from any potential threats. India will build a Naval Communication Station, Renovate the existing Air Field and develop Naval Anchorage in to a Strategic Naval Port. The goal is to have a Deep-water Pier, Port Facilities, Maintenance Buildings, Terminal, Clinic, Fuel Storage Area and Billeting/Messing facility for their personnel; to be developed/constructed by Border Road Organization of Indian Army. The Military Base on Assumption Island will be funded by India and shared by both Militaries as its location lends it strategic importance for monitoring shipping in Indian Ocean which would ensure the safety of its ships/vessels in the southern Indian Ocean. But there is a prohibition on any Nuclear Weapons Deployment/Storage and its use in case of Warlike Situation/War. 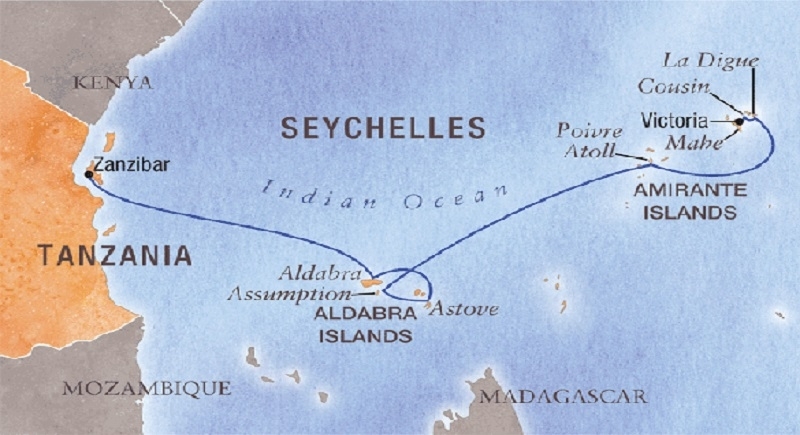 The project became controversial in Seychelles due to (a) Fear of influx of Indian workers who might dominate the economy,(b) A foreign power building a military base becoming an affront to sovereignty and national pride,(c) Its relative proximity to Aldabra Atoll, a UNESCO World Heritage Site, that is home to the world's largest population of giant tortoises, and (d) Why India be establishing a Military Base in Seychelles under the banner of SAGAR (Security and Growth for All in the Region), a Modi Initiative that seeks to develop better cooperation among Indian Ocean nations, as it differs from its stated goal. Though specific details of India's newly signed Seychelles agreement have not been officially released, a report by Janes 360 also confirms inclusion of a Naval Base and Air Strip. In response to Beijing's Overseas Military Base in Djibouti, India has sought and gained access to Seychelles, Oman and Singapore. Competition between China and India is spreading from Tanzania to Sri Lanka, to establish a stronger military and economic presence in countries along the Indian Ocean in a quest for regional supremacy. China is building "String of Pearls", a network of defense facilities around India under President Xi Jinping's massive Belt and Road program. New Delhi, unsettled by the thought of Beijing dominating its own backyard, is responding in kind. India Ports Global is developing the deep-sea Chabahar Port in Iran, widely seen as a counter to China's Gwadar port in Pakistan as future military uses of Chabahar by India cannot be ruled out. India has taken an initiative in establishing its first ever Military Base on Foreign Soil. We have shed inhibition nurtured for over six decades by doing so. It is essential that the project is completed in next two years for obvious reasons and that this opportunity is not wasted like in the past. Because if it happens, politicians will not lose anything, it will be a blow to our Defence Preparedness.